City of Surrey crews will be applying a herbicide to the invasive Knotweed in a continuing battle with this unwelcome non-native plant. The Dirt Jumps will be taped off and closed this week to allow the treatment to properly take. After a period, the grass will be trimmed and the jumps re-opened. Please respect this process and stay away from the closed areas. The South Surrey Cycles Trail Day on June 3 at SSBP was a great success! 18 members toiled in the golden trail dirt sifting out the rocks, hauling, placing and grading to perfection on the flow trails. Josh and crew made upgrades to the berms and rollers on lower Dy-no-mite Roll, Vince added new features to upper Jayride, and Larry & Robin moved boulders into place for a much improved Loop 'n Chute rock roll. Thank you South Surrey Cycles for providing the food energy to keep the crew fed. 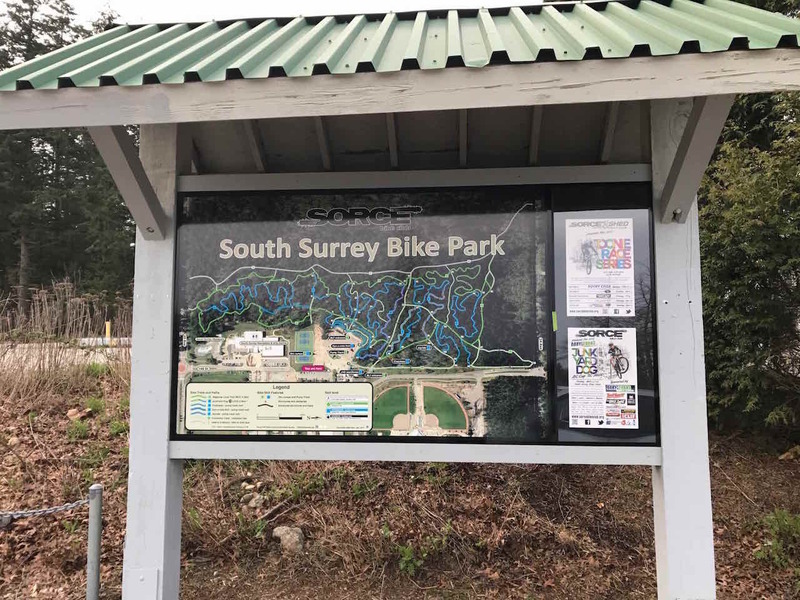 Trail Day on Saturday, June 3, 9am to 4 pm, at South Surrey Bike Park. 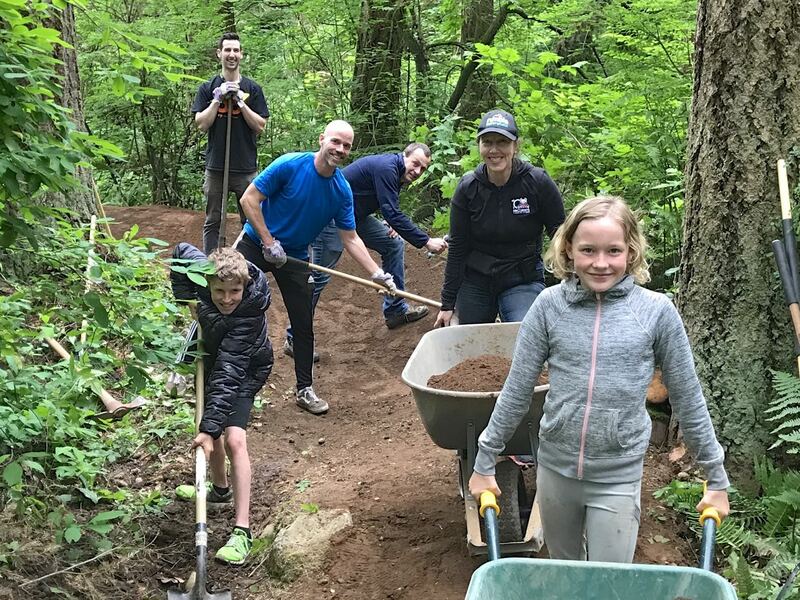 Last chance to haul some dirt, repair the trails and get things back into shape before the summer. South Surrey Cycles is providing coffee and morning treats. We will have lunch on site. Sunshine greated the Invergarry Pump Track Toonie racers on May 7, to pump the freshly maintained track by the crew from Dirt West. The 6 and under category was taken by Evan Weeks, while the 13 & under found Yusof Masood in 2nd and Owen Lowe in first. The hotly contested Adult category found Josh Kennedy with a 41.55 sec for 3rd, Alex Matthew's 39.46 an extremely close 2nd to Steve Lesley's 39.39! THANK YOU to The Bike Zone for some great swag and on site support. All the great photos can be found on our Flikr page HERE. LIVE video can be found on our FaceBook page. 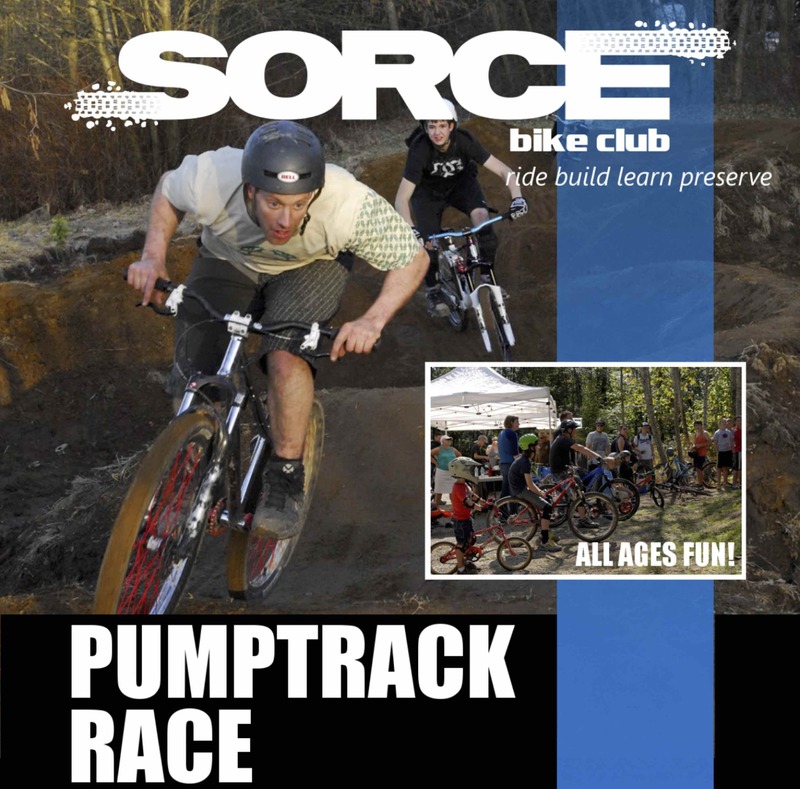 In partnership, Dirtwest and SORCE present The Bike Zone Invergarry Pump Track Toonie Race on Sunday May 7. Part of the SORCE Toonie series, we have 3 categories to pump around the refurbished pump track; 6 and under, 13 and under, and Adult. Prize medals, swag from The Bike Zone, pizza and beverages. As per the Toonie series, $2 to race, $2 for food, $2 for a beverage which will be a choice of juices, softdrinks, and water. Must be a SORCE member to race but includes the 2017 t-shirt so it's a great deal at $15 for student, $20 for single adult or $30 per family. 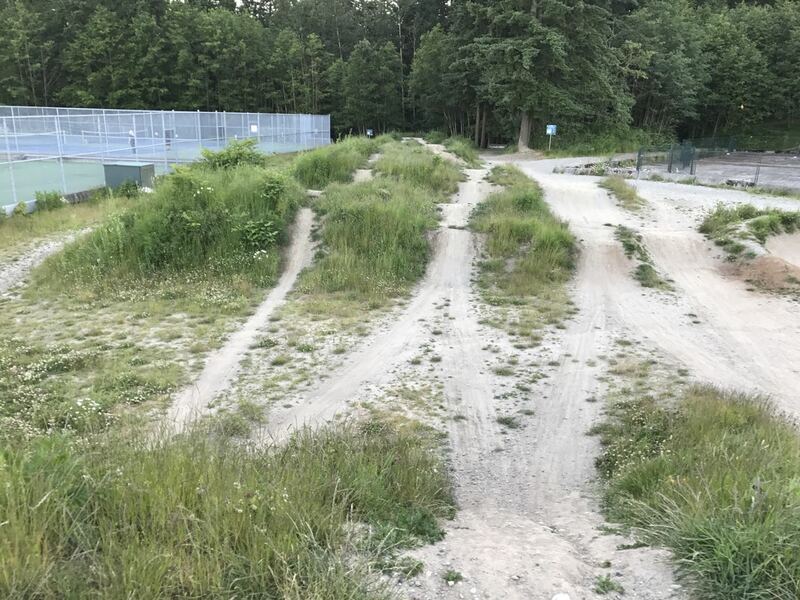 Invergarry Bike Park is best entered off Wallace Drive at 11297 Surrey Road. Registration open at 9am, raceing starts at 10am. This had to be the soggiest JunkYard Dog in history! The torrent left the course in a muddy state and took it's toll on the 96 registrants. The Red Racer Beer Garden and Papa Murphy's on site prepared hot pizza was a welcome reward for all the hard work. THANK YOU to all the workers, from the set-up crew, registration, course marshalls to the tear down. WELL DONE! 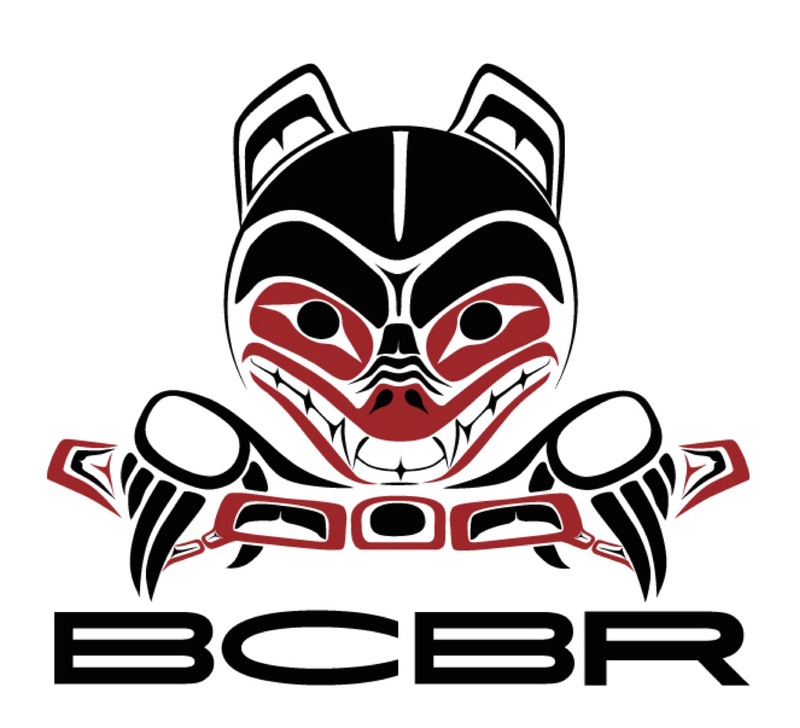 Our many sponsors - Daryl Evans Racing, Central City Brewery & Distillers, The Bike Zone, BC Bike Race, Physiomoves Physiotherapy, Norco, Clif Bar, Little Big Shot, Investors Group White Rock, Double R Rentals, North Shore Bike Shop, and swag from Race Face. THANK YOU. Full results are on WebScorer HERE. Elliot Jamieson, winner of U17, wears the aftermath of the conditions. After many months of designing, printing and building, the SSBP map sign has finally been installed. Through proceeds from the various Red Racer beer gardens, Peter, Larry and Mike finished the installation yesterday while we had a break in the weather. It not only includes the most recent trail upgrades, but has the JunkYard Dog logo with a post number at each junction to show the JYD route. On the right side is a bulletin board to properly display SORCE events. In the legend are QR codes to be scanned by your mobile device to instantly download the map. 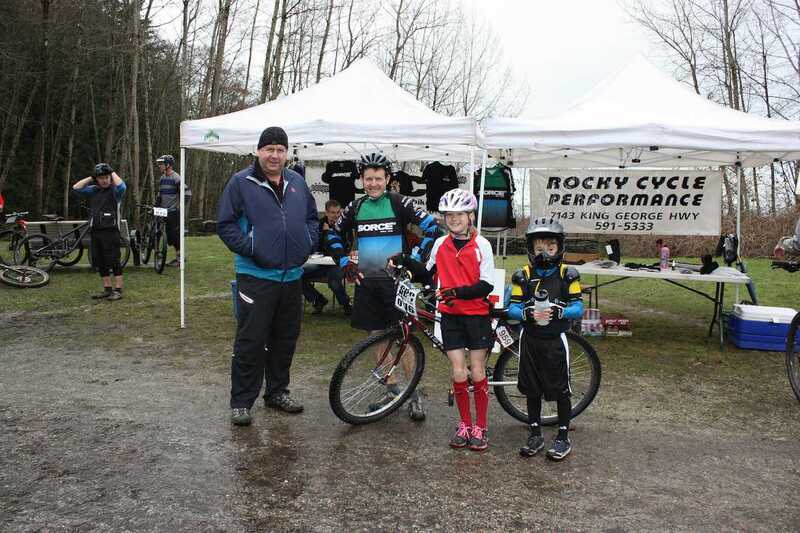 Cool, windy, but sunny weather greated 21 racers at the April 2nd Toonie #2 XC race at South Surrey Bike Park. The JunkYard Dog course was mostly dry, with a few muddy spots after the heavy rains of late. Racers were the first to try out a new feature, Little Ripper at sign post #8. Created by Vince and Larry, the drop is now augmented with a cool roll over, a rollable jump to follow, and into a mini rock garden. A perfect test before the JunkYard Dog BC Cup racers hit the circuit in 3 weeks. 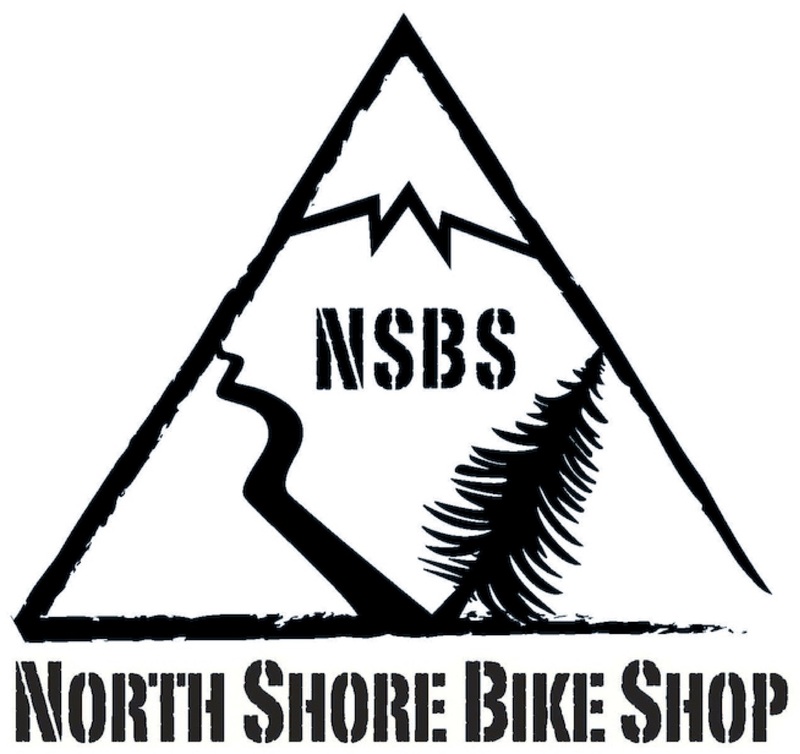 Special thank you to title sponsor South Surrey Cycles, who provided some cool swag and mechanic Justin with his full complement of tools for tune ups. He was kept busy. Check out the photos on FLICKR, and a couple live FB video clips of the action on our FB page. Race results on WEBSCORER. 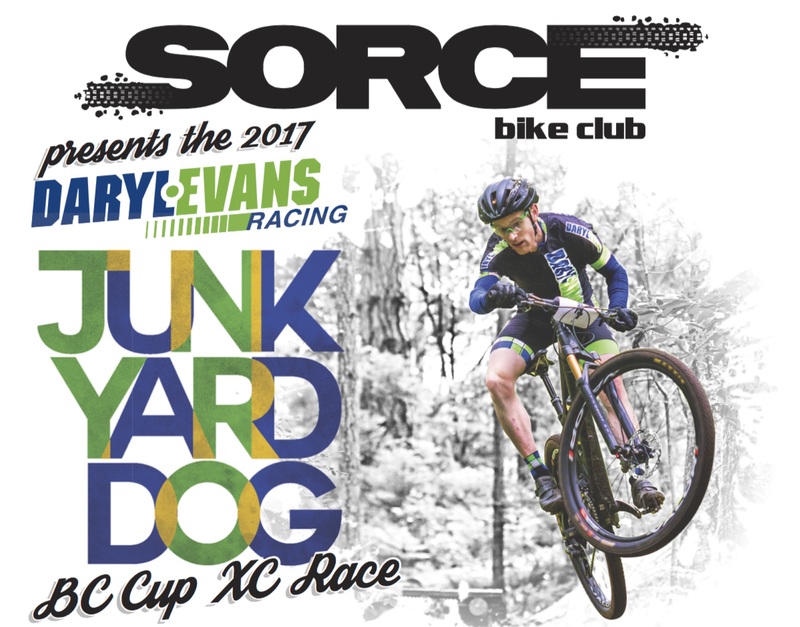 The JunkYard Dog BC Cup XC race is all set for April 23rd at SSBP. Registration is open with full details HERE. A respite from the rain greated over 20 racers at the Delta Watershed for Toonie race #1, March 12. Brett layed out another excellent course through the challenging trails of the Shed. The 5km laps took riders over familiar trails and some not so familiar to spice up the race. The mud was relentless but didn't dampen the racers spirits in the least - I think they relished it! Thank you Rocky Cycle for sponsoring the day with some great swag. Lorelei took some fantastic photos which are up on the Flickr page HERE. 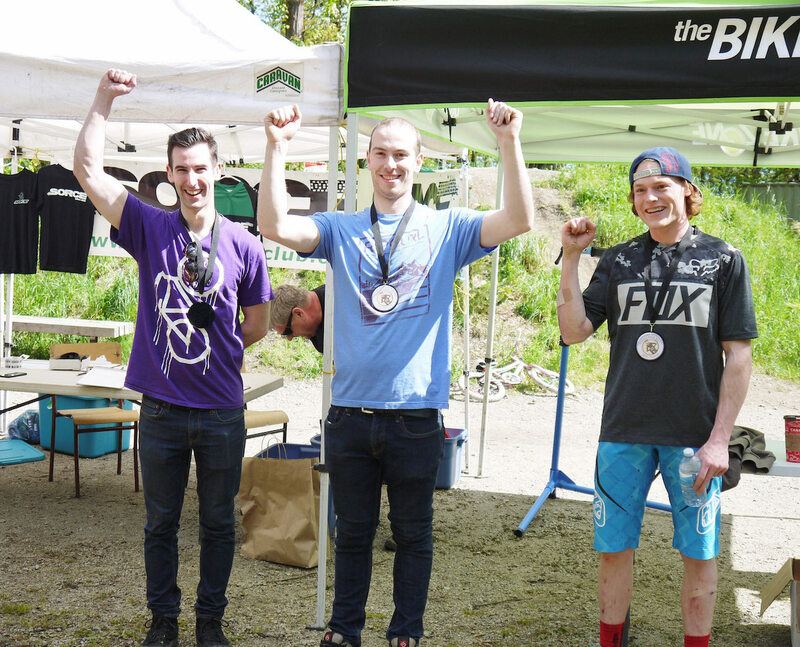 Toonie Race #2 is at South Surrey Bike Park for laps of the JunkYard Dog course on Sunday, April 2. We've got dirt - lots of it!